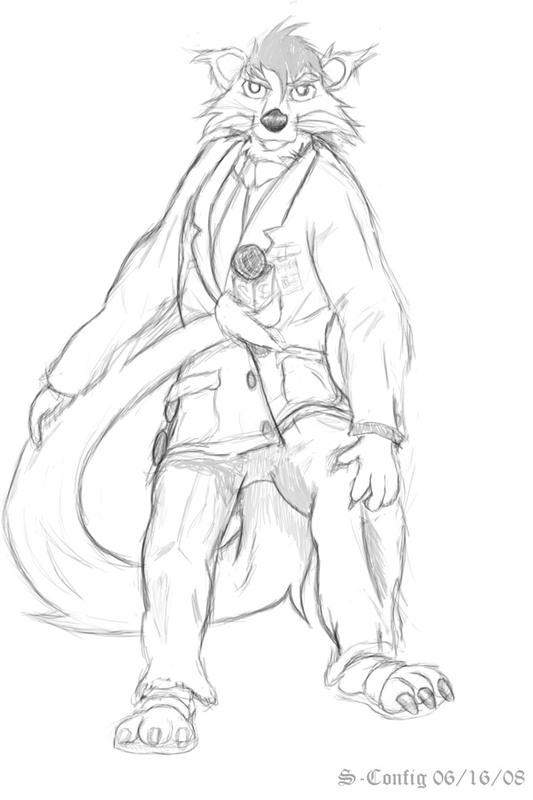 Mr. Viverredae was a project I wanted to try something different; And decided to draw a Binturong (Viverredae animal kingdom family) in an anthropomorphic form. It’s such a strange creature from Asia. 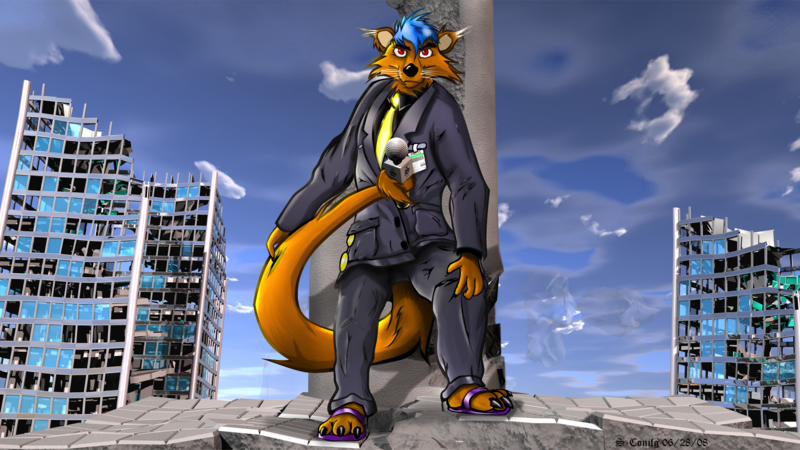 Anyhow, here it is complete with lightwave backdrop of exploded city behind him! Currently, Saxon Config Viverredae is a Male Binturong (Asian Bear Cat) approximately 5’9″ . His profession is a reporter in the future known as the “After-Now” network transponder grid. Whenever possible S enjoys the finer things of humanity such as nice clothing. Wearing things like business suits and glasses may be common for him. And having them custom fit to keep tail, feet and hands moving freely as he works. Although things like clothing is not really required. It’s something nostalgic of the old world yet also something to look forward to. S likes to believe that the suit regardless of form doesn’t make the fur. But the fur still has the duty to shine brighter then any textile he or she wears. First sketch of Saxon Viverredae. 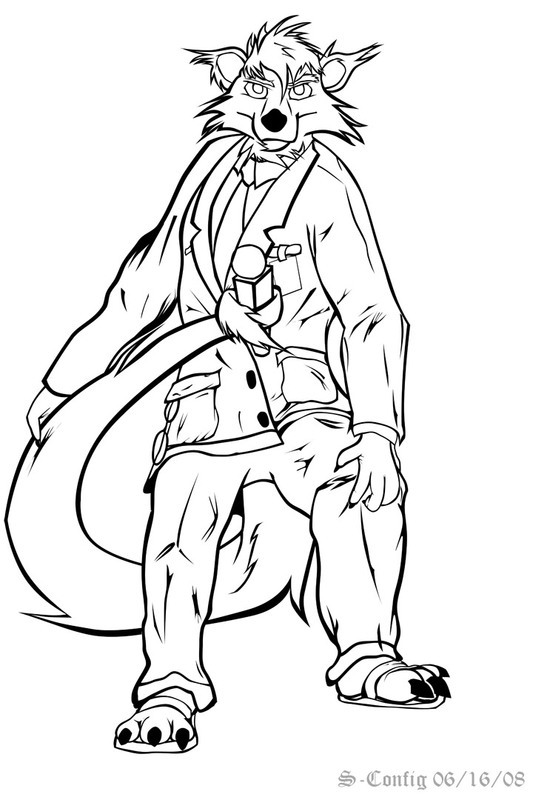 Looking at these pictures in retrospect I’ve come to realize how much I’ve botched making a Binturong (a.k.a. Chinese Bear-Cat). That their fur coat is grey-ish. smaller eyes. But the picture had too much grey to begin with. But all in all it was a fun picture to work on. There isn’t much of a story beyond Saxon except that he’s a reporter during the aftermath of the days of reckoning. A story that I was kicking around in my head for a while. 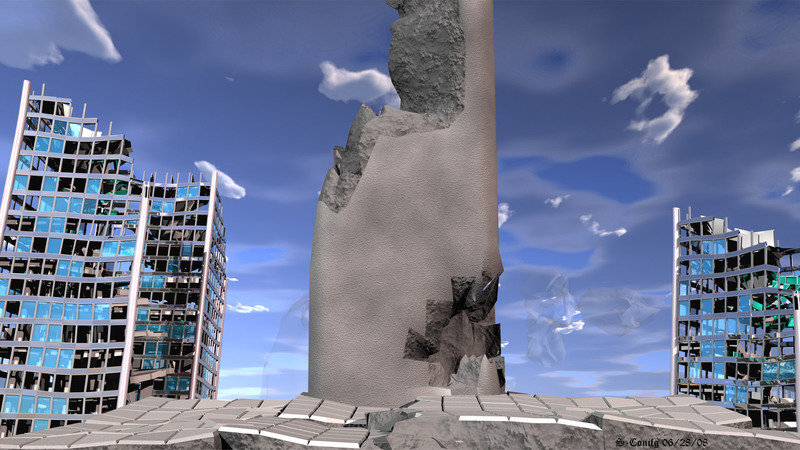 Picture was done in Lightwave 8, total render time on a athlon X2 3000Mhz was approximately an hour using a sky-FX plugin. Colored and inked in Photoshop. Wisconsin government tax pandora box. Don’t copy a floppy?